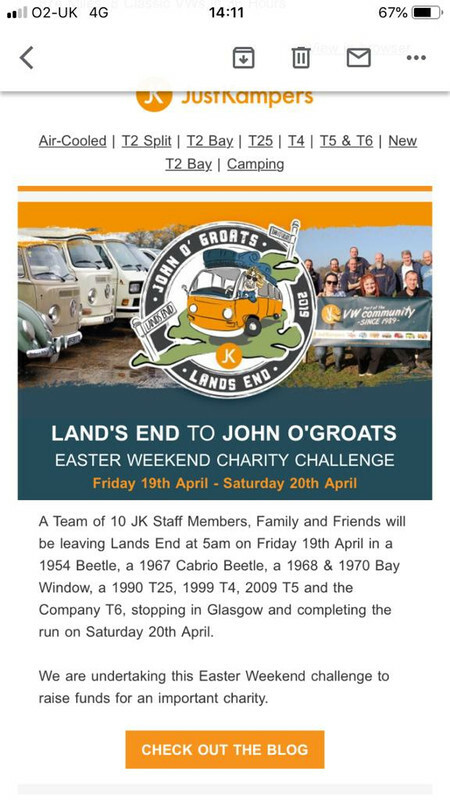 This is a discussion for the topic Just Kampers- Lands End to John O'Groats Charity Run Friday 19th April on the board Events, Cruises and Gatherings. Dave Fisher has asked me to share this event. Just Kampers are doing a charity run in support of Breast Cancer from Lands End to John O'Groats with a wide range of VWs. They are hoping for lots of the VW family to show their support and join them at some point on their route. They will be at Frankley Services at 11.00am on Friday 19th April and Dave and I are going to join them for a couple of miles. Anyone else fancy joining us? There is more information on their website and facebook page. I have good intentions to meet them up this neck of the highlands from Perth upwards. Friday and Saturday look half decent buggy weather so they've chosen their days well. I've had a look at the Facebook and website pages and see their route but don't easily see the timetable so thank you Vanessa for putting the detailed Frankley Services 11am info. interested and a possibility Frankley south bound may be awkward without going around but Lydiate ash junction and run down the slip road is simple. how far south are folk going. Keith I’d assumed they were coming from the south! Looks like we may be waving to each other. Spotted Hugh just testing and you passed, going North will be better to collect them further south than going north and even further north as guessing M5 from J3 up will be choka block on a bank holiday Friday as it has been stationary traffic for miles the last twice I have come south on normal afternoons. Frankley for 11 so guess J9 Tewkesbury about 10 then up to Frankley for the stop off, back on around the M42 and back down into Bromsgrove. Golly yes grid locked on the M6 in holiday traffic is not appealing. Intercepting the charity run south of Frankley would be good but unless they have something like Glympse we won’t know if they are ahead or behind us on the M5. sit on the J9 bridge from just before 10 or look at their blog if it is live updates on the day. It’s about 35 minutes from J9 to Frankley services. I wonder how accurate they are at timings. They could get a good run with the wind behind them or possibly get snarled in holiday traffic. Mind you traffic should be heading the other way - south. I met Keith & Vicky on J9 of the M5 and at about 10.15am Just Campers swept under the bridge. We followed the 6 camper vans to Frankley Services where other buggys and campers were parked up. A bit too nice a day to be on the motorway but at least it was flowing well and JK had kept well to their initial timetable. On of the Just Campers convey arrived late having taken it easy because of concerns about a low oil pressure light that it turned out was probably a damaged sensor. But Dave Fisher was on hand, and back, to lend a bit of Midland hospitality and help. I was slightly concerned that as I re-joined the M5 north I passed Lawson reversing back along the slip road - hope he made it home without to much hassle. Sorry Vanessa it wasn’t you posing it was Gail. But your car was definitely posing today ! A nice short notice ride out and good to see folks supporting the Just Kampers team efforts.